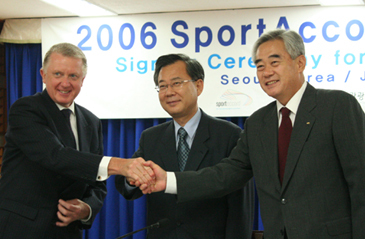 When SportAccord 2006 kicks off at the Grand InterContinental Hotel in Seoul, South Korea on April 3, there will be a significant number of cities, tourism boards and bidding organizations in attendance, according to a press release by SportAccord on Feb. 22, 2006. In the three years since it was established SportAccord has become known as the premiere platform for cities not only to gain vital know-how and insights into the mechanics of hosting major events, but also to meet and reach out to the key sports leaders who will decide or influence the decisions on where future events will be held. There will be 17 countries represented by the exhibitors at SportAccord 2006. These are Australia, Austria, Brazil, Bulgaria, Canada, Denmark, England, Korea, Northern Ireland, Republic of Ireland, Russia, Scotland, Serbia & Montenegro, Singapore, Spain, Switzerland and Taiwan. One bidding organization which will be exhibiting at SportAccord in 2006 is SportDenmark, which will be at the conference for the fourth time. Throughout the last three months Denmark has won the staging of many major events, including the ETU European Triathlon Championship 2007 (Copenhagen), the FILA World Wrestling Championship 2009 (Herning – the western part of Denmark), and the prestigious International Olympic Committee Session & Congress 2009 (Copenhagen). Lars Lundov, Executive Director of SportDenmark, says: "The assignment of these vital events is the result of intensive, well-structured and strategic bidding efforts demonstrated through some time by the relevant Danish ministries, local authorities (municipalities) and sports federations in conjunction with Sports Foundation Denmark to establish the best frames for hosting major sports events in Denmark." "To this should be added that SportDenmark's yearly participation with a stand at SportAccord since its start in 2003 has no doubt contributed to important and valuable relationships with top leaders within the international sports society," he adds. "And also it has enhanced Denmark's profile globally as an attractive major sports events destination. SportAccord has become a platform for our mutual efforts to attract more major international sports events to Denmark, and for SportDenmark as well – which is a network between Sports Foundation Denmark and the leading Danish events cities." In 2006, one of SportAccord's two breakout streams will focus on 'Staging A Successful Major Event' and will cover areas such as Event Branding, Facilities/Venue Development, Knowledge Transfer, Staffing and Volunteers, and Bidding Cities. Event hosts John Furlong, Chief Executive, Vancouver 2010; Joachim Gossouw, General Manager Sports, World Games 2005 GmbH; Carlos Arthur Nuzman, President, Organising Committee of the XV Pan American Games Rio 2007; Wang Wei, Executive Vice President & Secretary General, Beijing Organising Committee for the Olympic Games 2008. Regional events companies Peter Abraam, Chief Executive, Victorian Major Events Company; David Simon, President, Los Angeles Sports Council. Event consultants Richard Bezemer, Principal, The Contemporary Group; David Churches, Senior Advisor: Event Bidding & Delivery Strategies, The Contemporary Group; Peter Mann, Chief Executive, PMP Legacy. Bidding cities Derek Casey, Bid Director, Glasgow 2014. Olympic Games executive board Christophe Dubi, Olympic Games Deputy Executive Director, International Olympic Committee; Gilbert Felli, Olympic Games Executive Director, International Olympic Committee. Venue specialists Barry Lowe, Managing Director, HOK Sport+Event+Venue. Event PR Mike Lee, Chief Executive, Vero Communications Ltd.
Lundov adds: "We very much look forward to SportAccord 2006 in Seoul and meetings are already scheduled with a number of international sports federations and key industry decision makers. If SportAccord 2006 will be as successful as its counterpart in Berlin in 2005, there is every reason to congratulate all parties involved and to thank GAISF for the initiative."